WASHINGTON — House Democrats are putting forward a proposal to reopen the federal government by severing funding for the Department of Homeland Security from the other spending bills that enjoy bipartisan support — a gambit aimed at forcing President Trump to negotiate or shoulder the blame for a protracted shutdown. The Democrats’ plan, to come up for a vote on Thursday when they take control of the House, consists of six bipartisan spending bills that would fully fund agencies like the Department of Interior and the Internal Revenue Service through the end of the fiscal year. The proposal would also extend Homeland Security funding at current levels through Feb. 8, including $1.3 billion for fencing but no funding for Mr. Trump’s border wall — a provision that renders it dead on arrival in the Republican-controlled Senate. By splitting off the Homeland Security bill, Democrats are essentially daring Mr. Trump and Senator Mitch McConnell, the Republican leader, to keep a big chunk of the government shuttered over the president’s demand for the wall. It is far from clear what the Senate and the president will do. The measures would create a month for Mr. Trump and the Democrats to negotiate over the border impasse. Still, if the Republicans accept the Democrats’ term, Mr. Trump would lose much of his leverage in the border wall fight. Mr. McConnell has already said he would not bring up a measure that does not have the president’s support — a point his spokesman, Don Stewart, reiterated on Monday. Still, with the shutdown stretching into its 10th day and with federal workers about to miss their first paychecks on Wednesday, Democrats are gambling that Republicans will ultimately have to blink and relent on the border wall. 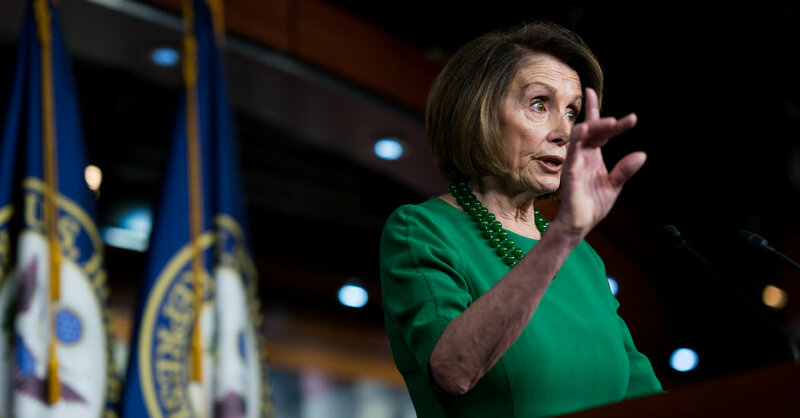 Representative Nancy Pelosi, the California Democrat and incoming speaker of the House, has continued to insist that Democrats will not cave on the issue of wall funding. Neither side appears ready to budge. By passing only a short-term funding extension for the Homeland Security Department, Democrats would effectively prolong the divisive debate over the wall — and potentially open a path for progressives to push for a broader immigration overhaul. That could complicate the early days of Ms. Pelosi’s leadership, but Democrats say they hope their plan will draw a sharp contrast between them and Mr. Trump, by projecting an image of a responsible party trying to govern in a capital ruled by a president who thrives on unpredictability. In the Senate, lawmakers of both parties have been pushing for Congress to play a deeper role in negotiations with the president. Senator Richard Blumenthal, Democrat of Connecticut, echoed the sentiment.